I asked, "Can I write an article about new humor websites and webcomics?" The Escapist responded, "Okay, go for it." Said I, "Woohoo! I'm starting my research." And then 10 minutes later: "Holy crap." For me, feeling like an idiot usually takes longer. I realize my incompetence gradually through steady labor, like digging a grave. This time, surveying web humor became, within 10 minutes - maybe 15 - stupidly hard. Humor sites, especially webcomics, spread like germs. Look at Comic Genesis - ye gods. Comixtalk, Fleen, The Webcomic List, Joystiq's Weekly Webcomic Wrapup and a few other news sites try to stay current, sort of. But in June 2008, after just eight months, Webcomics.com gave up, sold its URL and fled into the night. The web has aggregated acres of once-diffuse scribblings. Hordes of idle young amateurs used to write stories for science fiction fanzines and scrawl cartoons for college newspapers, but no observer ever saw more than a fraction of their effusions. Today they still write and draw the same stuff, in the same quantities, but we see all thirty zillion of them, a newly visible concentrate of samizdat, on Fanfic.net and DeviantART and College Humor. So the Idiot Feeling arrived fast this time, bringing its special friend Panic Attack. 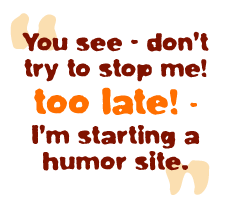 I had a personal reason for looking into humor sites, and because of that, an even greater reason to feel overwhelmed. You see - don't try to stop me! too late! - I'm starting a humor site. Every site is already familiar to somebody, and if you mention it, the old fan gets snarky. "Gone With the Blastwave? News flash, it's up to Strip #39! Hey, check out this 'new' site The Onion, ahuh ahuh!" Conversely, humor sites already known throughout the civilized world continue to make converts. When I asked friends to suggest new sites, they proposed Cat and Girl (now in its ninth year), Wondermark (started April 2003), Sheldon (June 1999) and other bulwarks of the eons. You can bet a lung that, even at this moment, some newbie in Kansas is discovering Cracked.com or ICanHasCheezburger or Worth1000 or eBaum's World or PvP or Ctrl+Alt+Del or your own dozen favorites that I've bizarrely, unjustly, infuriatingly omitted - and, fired with zeal like stout Cortez upon a peak in Darien, Kansas Newbie will complain when this article omits that great new site! It's pointless to focus on "new" sites. On the web we're all, always, newbies. Take Schlock Mercenary, which in late August 2008 celebrated its 3,000th strip - or, as creator Howard Tayler put it, "3,000 consecutive days of no missed updates, no fillers and no guest strips." Even so, it's entirely possible to surf the web six hours daily, read Digg and Reddit and 250 RSS feeds, and yet miss this popular eight-year epic. (Trust me.) Which ones have you missed? Check the webcomics lists at Wikipedia or Webcomicz - or even Wikipedia's much shorter list of "self-sufficient webcomics" (those that support full-time creators). What, you don't know them all? Greetings, fellow newb.